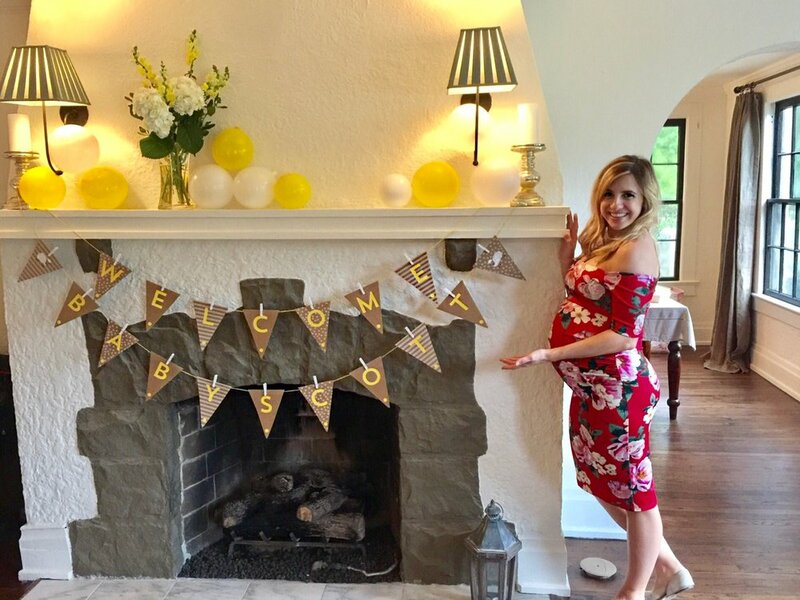 Baby Shower in Birmingham! — deep hunger, deep gladness. I feel like I am getting so spoiled during the month of October. Jordan is transitioning from one practice to another, and in between, he took three weeks off. We've been to Tulsa, to Santa Fe, have gotten to spend TONS of time together (beginning each morning with him waking up before me and bringing me coffee - #winning! ), and last weekend, we got to see so many friends and family members in Birmingham. Most of my family still lives in Alabama, so when it came time for a baby shower, Birmingham made the most sense as a host city. My sweet Aunt Dana, Mom's youngest sister, volunteered to host! She'd just re-done her beautiful kitchen in Homewood, and it was the perfect location to have a little party. The theme was "Mary's Little Lamb" - how cute is that?! I wanted to keep the guest list small because I like the idea that the people in attendance will really be a part of this baby's life in a meaningful way. Despite the nasty hurricane weather, I was touched that friends and family gathered to celebrate the arrival of this baby. Moments like these make me want to fall on my knees in gratitude for the love, encouragement, and support I always receive from the people closest to me. Every gift I received was SO generous, but a couple of highlights stood out from my two grandmothers: my dad's mom, who I call "Nonnie," gave me a pair of baby booties that my dad wore when he was an infant. So special!! My mom's mom, who I call "Gee Mommy" (I know, I made it up as a child, it works for us), gave me the Christening gown that all my cousins on my mom's side have been Christened in, beginning with me. I was the first grandchild on both sides, just like this baby will be, and so it was a really neat moment to think about the legacy of this beautiful gown. Another really unique thing about this time in life is that one of my best friends on earth, Ginny Tyler, is pregnant and is only THREE WEEKS behind me. How insane is that?! Totally by accident, we're pregnant together. What makes this even more significant is that Ginny and I have photos of us together as little babies, and now OUR babies will be friends! It makes me cry. I can't. Jordan saw that baby picture of us and asked if my hair had been burned in a fire. Um, NO THAT'S JUST HOW I LOOKED AS A BABY, thank you, Jord. Extra great was that my grandfathers came to pick up my grandmothers, so I got to see and love on the important men in my life, too! I'm missing one sweet grandfather, Hank, but he was there in spirit! Thank you so much to everyone who made this day memorable for us - I already count it as one of the sweetest parts of pregnancy to be able to spend time with such an incredible group of women.